It is a beautiful commute along Lynch Hill Park in Whitchurch, Hampshire, especially in the autumn. Pity that it is stressful sometimes. Reducing road danger is not worth bothering about – at least that is the feeling I have after receiving replies from my county council and my elected police and crime commissioner. Most days, my commute by bicycle is uneventful and generally a pleasure (rain or shine! ): I cycle from my house to my local train station. Then, at my destination, I cycle from the station to work. 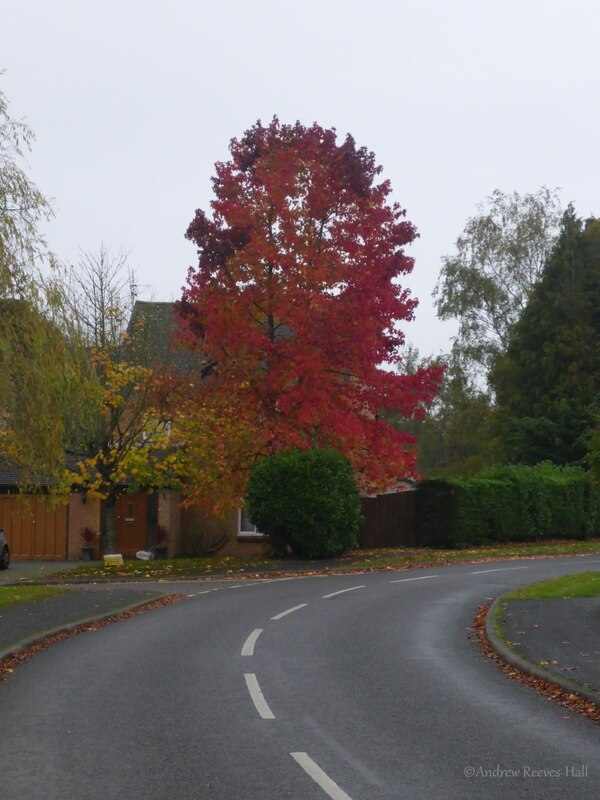 Lynch Hill Park in Whitchurch, Hampshire is a mainly quiet residential street with a speed limit of 20mph. It is, though, used as a rat-run by people who are travelling from the east to the north, or vice-versa, to avoid the town centre. The street is long and straight with a slight bend here and there, except at its northern end where it meets up with Dances Lane. Here, it zigs then zags around blind corners. Here, it is very difficult if not impossible to see if there are oncoming vehicles in the opposite lane. On some occasions, my commute gets stressful: I hear people driving their car up behind me just as I approach this series of bends. Often, I know what is about to happen. For example, when you are approaching a corner or bend. Not all “rules” are equal – only the ones with “MUST” or “MUST NOT” have the law behind them. This “rule” is the one frequently broken by people driving their cars around the bends on Lynch Hill Park. More than once there has been an oncoming vehicle that has had to take emergency evasive action to avoid a collision. As I pointed out to one driver – for I often catch up to them at the T-junction a 100 or so metres ahead – they risk not only my life but also theirs, plus possible damage to their car and increased insurance premiums (my hunch is that these latter items have more impact). Sometimes, the excuses I hear are out of this world; and sometimes the person driving just looks at me through a rolled-up window and then drives off. All incidents like this that I experience are duly noted in Collideosco.pe and reported to my local “safer neighbourhoods” police force. The Near Miss project (which I participated in but am otherwise not affiliated with) aims to publish information which influences street design. Cycling near misses, like SMIDSY’s, close shaves or plain rudeness, can be unpleasant and off-putting. They can influence cycling behaviours and people’s decisions to cycle at all. If too frequent, they could serve as a warning for more serious incidents. To prevent them, we need to know how common they are, why they happen and what effects they have on people. We want our findings to be used by planners and policy-makers; to inform street design, for example. We‘ll work to engage the public in an informed debate and help all road users better understand how a minor incident might affect a person cycling. The office of the police and crime commissioner told me that breaking rule 166 of the Highway Code “would not be a matter in which the police would intervene”. As I had no progress from the local police team, I asked my county council, who are the highways authority, and my police & crime commissioner whether they would take action to reduce road danger along Lynch Hill Park. All of these were rejected; and they offered no ideas of their own. You can read their replies in the CORRESPONDENCE section below. In other words, neither the police nor the county council wanted to lift a finger to reduce road danger along this residential road where many families live, and children cycle or walk to school. Aside: Last February, the judge hearing the case of a person killed by a driver allegedly instructed jurors to ignore the Highway Code. Some violators of rule 166 along Lynch Hill Park cause oncoming drivers to take emergency measures to avoid a crash. Governments love to run awareness campaigns; so, I have decided to follow in their footsteps. Earlier this year, I bought some small keyfob-sized cameras that I mounted front and back on my Brompton bicycle; During the Black Friday sale in November I upgraded to slightly higher quality – and more importantly waterproof – cameras. I have now captured several of the near misses on video and sent them to the police. Now, I have embedded them on a new page to raise awareness of the issues: NEAR MISSES. A head-on in Fleet resulted in a summons for the law breaking driver; but apart from that, there has been no action for the other cases that I have reported. One local business, told me that they intend to use my video of their van driver overtaking me as a component of their company’s driver training. My emails to and from various government and publicly elected officials. My emphasis added. Subject: Fwd: Warning sign on Lynch Hill Park? I want to make you aware of an issue of several people breaking rule 166 of the Highway Code along Lynch Hill Park in Whitchurch, Hampshire; and ask if you have any suggestions for what could be done to reduce road danger there. I have informed the police on each instance; and am still waiting to hear the outcome from consultations between PC **** and PCSO ****. I have also asked my local councilors to suggest what they think can be done. See below. Thank you for your email. I have undertaken some research to understand the nature of the problem you report. Rule 166 of the Highway Code states – DO NOT overtake if there is any doubt, or where you cannot see far enough ahead to be sure it is safe. It the then goes on to provide some examples of where this might be. Accordingly the drivers overtaking you in contravention of this rule do not commit an offence per se and so it would not be a matter in which the police would intervene. Is there anything that the PCC could suggest which could be done to reduce road danger here? Thank you for your email. I have searched the police information systems for the past 12 months (01/01/14 to today) to try and establish the extent of the danger in Lynch Hill Park. I have asked for all incidents of anti-social behaviour related to vehicles, complaints recorded relating to the manner of driving and also collisions ranging from non-recordable through to fatal collisions. There has been only 1 recorded entry which I could find that related to this stretch of road (2 other incidents were returned as the people reporting came from that road but the incidents took place elsewhere). That report was made by a patrolling police officer in relation to a vehicle that they wished to stop. It would appear from this data that either the problem is not being reported to the police, or that the problem is not as great as it might appear. In terms of action that can be taken, as I have mentioned in my previous email the drivers are committing no offences by overtaking in this manner. Also as the Highways department have explained they have no plans to re-mark the road or to add to the signage already present. The police, Police and Crime Commissioner nor the Highways department however, cannot alone change the behaviour of people when they driver their cars. To bring about this social reform requires all of us to be involved, leading by example and attempting to influence those around us to drive with more consideration for all road users. Thank you again, Inspector, that is a very helpful answer; and I greatly appreciated the research you conducted. Whenever the overtaking has taken place, I attempt to speak calmly and politely to the drivers when we (often) meet up at the T-junction a 100m or so ahead. If you have other suggestions to bring about the social reform then I would be most welcome to hear them; and help make them happen so that road danger is reduced. More publicity of the incidents may help, for example. Whilst re-reading your reply I was struck by the statistics: not one of my complaints to the police have been recorded! Can you explain why my reports of each incident this autumn have not been recorded? I sent them to our PCSO and often cc our PC. I am sorry but I am unable to explain why the complaints have not been recorded. I can only suggest that you contact the PCSO or PC or direct your question to the Constabulary. The information I have given you was directly related to the road you named and limited to the driving complaints as I mentioned. >> drivers are committing no offences by overtaking in this manner. The police do change the behaviour of people through enforcement and raising awareness: the police’s campaign against driving whilst drunk was again quite forceful this past Christmas. The combination of raising awareness, education and enforcement was key. Society no longer tolerates driving whilst under the influence and look to the police to rid our roads of people that do so. In regards to the overtaking on blind bends, the police do have ability to change people’s behaviour: driving without due care and attention, and driving without reasonable consideration for other road users. Repeat offenders might be considered as having driven in “a standard below that expected of a careful and competent driver”. Surrey’s road policing unit have successfully prosecuted poor overtakes and continue to encourage the public to report other instances of poor overtaking. – police, at least in Surrey and likely elsewhere, have the *will* to do so. Can I count on my Hampshire Police & Crime Commissioner and the Hampshire Constabulary to address the issue of road danger more robustly than at present? Your original question, which I attempted to answer was very specific and related to “people breaking rule 166 of the Highway Code along Lynch Hill Park in Whitchurch”. In more general terms, the police and the Police and Crime Commissioner do take road safety seriously. However in times where resources are limited, those scarce resources must be directed towards the areas in which they will have the greatest impact. So far as roads are concerned, that is working to reduce the number of people killed and seriously injured on the roads each year. In relation to the second part of my answer, you will see that I said that the police, Police and Crime Commissioner nor the highways department however cannot ALONE change the behaviour of people when they drive their cars. The example that you have used illustrates that point well. As you have stated in your latest email it is now socially unacceptable for people to drink and drive. This has been brought about over a period of time and it is the attitude of most of society that has changed, no longer do you hear the expression “one for the road” being used. Whilst the police continue to play a part in this through Christmas and summer drink drive campaigns this change cannot be attributed to the police alone. The roads authority in my area is Hampshire County Council. Subject: Warning sign on Lynch Hill Park? There have been several people that have broken rule 166 of the highway code along Lynch Hill Park, namely, they have overtaken me on a blind bend. I have reported the recent incidents to the police as I now have photographic evidence; the issue has affected me for a number of years, though. May I ask you to erect warning signs at the blind corners to alert drivers that people may be cycling along the route? See attached map. Would you also consider painting a solid (no passing) white line down the middle of the road; or alternatively, to remove completely all on-road markings, as studies have shown this to reduce road danger. UK Highway Code Rule 166: DO NOT overtake if there is any doubt, or where you cannot see far enough ahead to be sure it is safe. For example, when you are approaching a corner or bend. I am afraid the road sign you have suggested is not appropriate as the sign warns traffic ‘of a place where a cycle route crosses or joins a road’. Furthermore, no road signs associated with cycling are considered necessary on Lynch Hill Park given the character and use of the road. Formal overtaking restrictions are not considered appropriate for in this situation and it is also preferable to retain centre line markings around bends to separate opposing traffic flows. I am sorry I could not help further with your enquiry. Thank you for the reply, Mr. Kettlewell. 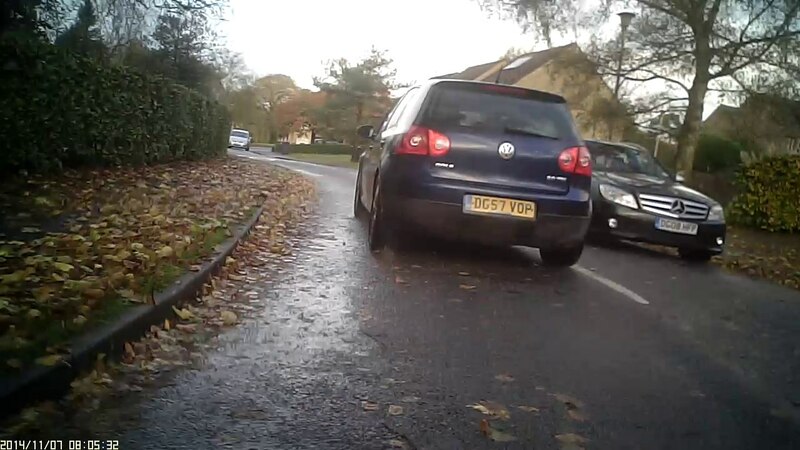 Given the several people that I have encountered who are overtaking on the blind corner contrary to the Highway Code, then could you make a recommendation if my suggestions were not acceptable to Hampshire County Council? You said that retaining a centre marking is desirable – so what about making it solid lines (no passing) around those bends? Thank you for your further message. As mentioned in my first response to you, formal overtaking restrictions are not appropriate in Lynch Hill Park. Any further road signs or carriageway markings in the road would be ineffective and create sign clutter. I don’t consider any traffic management measures are needed in response to your request and I am unable to help you further with your enquiry. The town of Whitchurch, Hampshire has 12 elected town councillors who are volunteers and sit without political party affiliation; the borough council is Basingstoke & Deane (“B&DBC”). The county council is Hampshire (“HCC”). I am very disappointed that Hampshire County Council will not be dealing with the situation of illegal overtaking on Lynch Hill Park. See follow-up message below. Again today I had a near miss there – the driver of a grey VW van overtook me on a blind bend. Thankfully there was no oncoming vehicles. It has been reported to the police, as have all the other incidents recently (this is a long-running issue over the past few years). I am still awaiting to hear if the police will do anything but I fear that without a cooperative Hampshire County Council that their hands have been tied to a large extent. I would most welcome input and ideas about what could be done given the response below. Furthermore, one might think that abuse of rule 166 may also constitute driving that is “of a standard below that expected of a careful and competent driver” and thus form the basis of a careless driving charge, though that seems less likely—not least in light of the judge’s remarks in the Petterson trial. They have also encouraged me to report poor overtaking. Indeed I have a report underway at the moment. So I would perhaps continue discussions with the PCC’s office: bad overtaking is something which *is* covered by legislation and which the police certainly *do* have the power to address, and—in Surrey at least—they also have the will to do so. Thank you for that helpful comment. I have written again to the Police and Crime Commissioner with reference to those points (and included your last paragraph in the summary). Many thanks! 30 years ago, some cars had the indicator lever on the left of the steering column : some had it on the right. If a learner is thinking ‘lift the lever up to signal left’ then they will get it wrong in a foreign car ! Think ‘clockwise’ or ‘anticlockwise’ : not ‘up’ and ‘down’. ‘Reasoning’ for overtaking on a blind bend ? Not a clue ! The level of logic is consistent with the signalling, though. “I had to be speeding to race you to the corner in case something was coming” ? Maybe if you were right-of-centre in the lane, positioned and signalling as if to turn right ? I would think a double white line would work – I don’t know what formal guidelines exist – TSRGD or something ? Is there a Parish Council which would help ? Ah, looking at the map, it’s a rat-run – a residential street that is shorter than the main road alternatives. Not intended to carry through-traffic. What are the odds residents would support closing it at one point to block through-traffic ? Alternatively, have you considered augmenting the white line to solid with your own pot of paint ? Google Street view shows the line had worn away completely – perhaps it might wear away again, somehow ? Maybe you could start (or simulate) a ‘Community Speed Watch’ scheme there ?